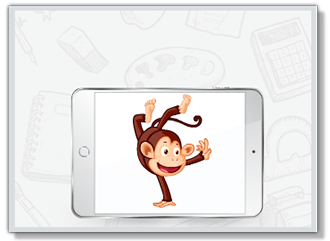 In Monkey Junior, each language's learning program is divided into many levels. Words, sentences, and phonics rules are arranged into lessons with the right sequence and structure to match every child's learning ability. Each lesson has five parts and lasts only five to seven minutes, which suit a child's level of comprehension and concentration. At the end of each session, little readers will receive a star, and also a sticker in the end of a lesson, which helps keep them excited as they can learn and play at the same time. Select the following languages to see their sample lessons. The two most important elements in teaching children a language is regularity and maintaining the child's interest in the matter. 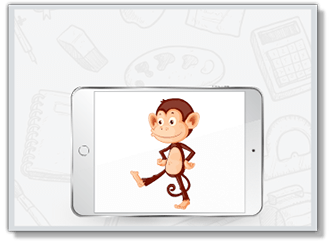 Understanding this, Monkey Junior has built a massive and comprehensive lesson system so children are always ready to learn every day. The length of each lesson is appropriate for a child's ability to focus. 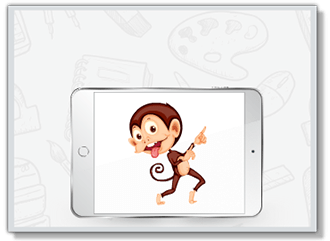 In addition, the archive of lively pictures, videos and sounds, and a collection of diverse interactive games and prize stickers always attract and inspire children when they use the program.